A finger-play activity board book for young children from new talent Lucie Sheridan. 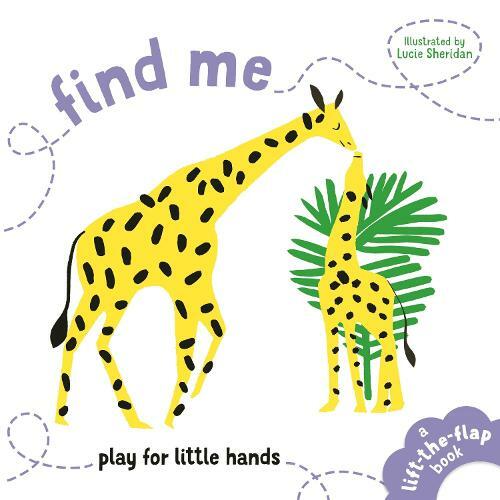 Find Me features simple lift-the-flap activities that can be completed by little hands. Find Me invites young children to interact with bright, bold artwork to find cute creatures hiding in playful scenes. The final page reveals the animal friends that have been found along the way going wild at a party. TICK TOCK, TICK TOCK, who's crept inside the cuckoo clock? Who's playing hide and seek? TAP, TAP, TAP on every shell and take a peek. Rhyming text and sound inspired words encourage kids to interact with each scene and lift the large flaps to find which creature is hiding underneath.